Photo of embroidered artifact plus modern re-charting. 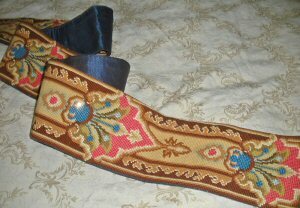 Baroque French design, intended for use as a decorative accent, belt, suspenders, or curtain tie-back. Can be done in Berlin woolwork, needlepoint, cross-stitch or beading. Original was 8 feet, 3 inches (about 2.5 meters), in muted colors of silk and wool. Images donated by ebay seller cotswoldcats, charted by Sytske Wijnsma.